Wow! Its past my bedtime, but wanted to try to get some photos onto the blog. The towels I finished has transformed in front of my eyes. 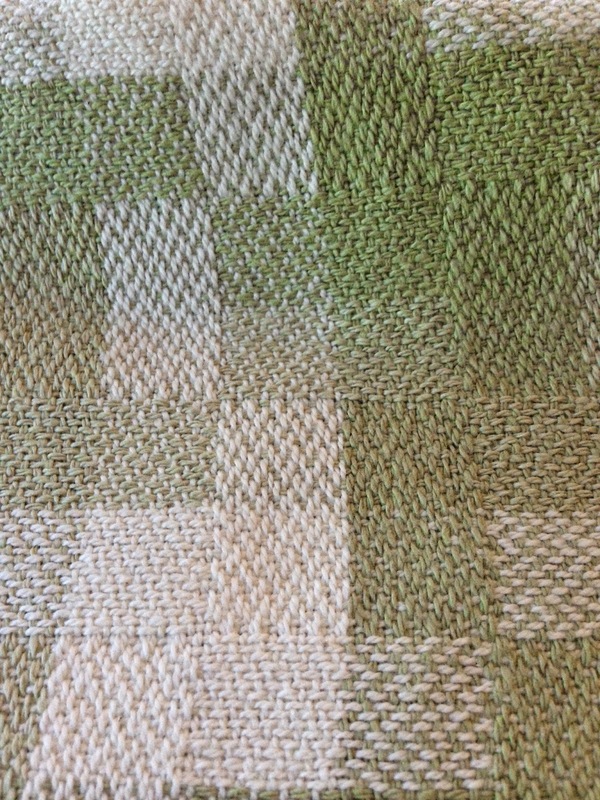 When I first dressed the loom, all three colors – off white, light green and dark green appeared to be one color. Seriously. 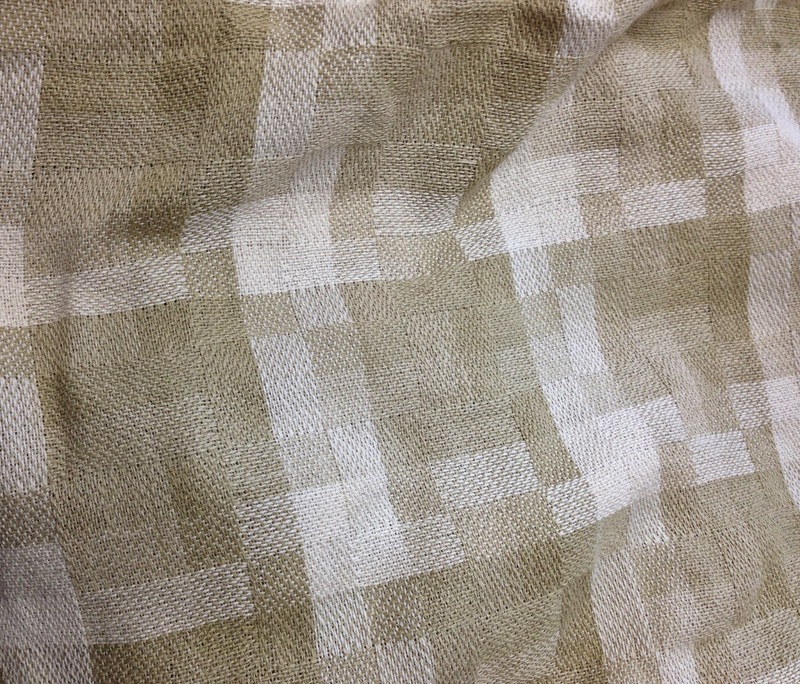 100% organic cotton darkens when exposed to heat – it does not fade. But I try to hold off exposing it to heat, so that the person I give the towel(s) to can see it change. This was a fun one to weave. With the towels done, the next task was to remove the loom to my shed for my trip north. Well… the loom had other ideas. This particular loom folds up, similar to scissors. I got it into the rig, I should be able to get it out, right? I could not get it past the door frame. So had tried to get the strollers/wheels off. At this point, I need help – cause nothing is working. So called Bernie & Caroline. Of course, this had us starting from scratch of folding it back up higher with Bernie’s strong arms. Still could not get it out the door. So in this picture below… Caroline is on the floor under Bernie’s legs – they are working as a team to attempt to get the wheels off. As they puzzled thorough the loom mechanism – I offered to take them to lunch for their attempt to help. So after 4 1/2 hours, we put the loom back in place and went out to eat. Crazy stuff. So I will have to leave loom in my rig for the winter. It should be ok, but I really did not want to leave it in the rig. It is what it is and will just go with it. I’ve been so very busy here… really great people here at Evergreen Coho. I haven’t laughed this hard or this often in eons. Have thoroughly enjoyed my stay here and am looking forward to returning. Now back to work, ere sleep. I’ve got a full day tomorrow… hoping to get it all done. Then have a laid back type of day on Sunday, as I head out on Monday. Looking ahead to the first of October – all the provincial parks, and majority of RV parks close by the end of September in Canada. I had hoped some might have been opened… but its not meant to be. So will have to deal with it like I did when I traveled in April in Canada. Hopefully, it will be warmer in October then it was in April – but time will tell. But it will be awesome to have the road to myself once again. More later.